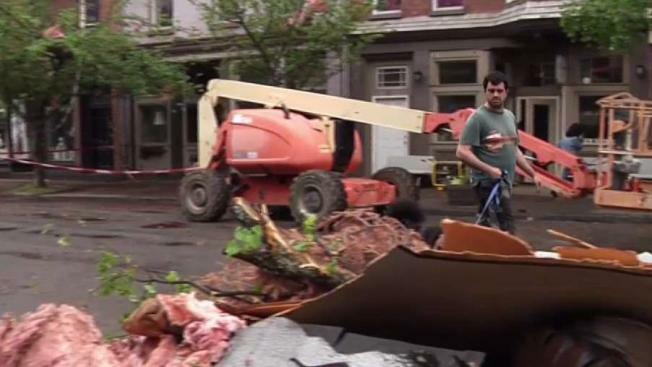 The storm cleanup in Newburgh was far from over Wednesday, after two people lost their lives in the severe weather event. Adam Kuperstein reports. 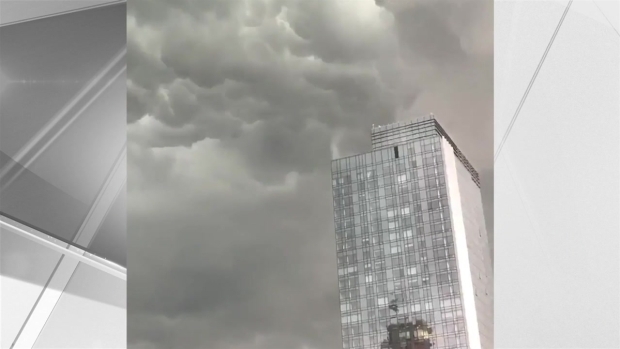 Powerful storms pounded the tri-state on Tuesday with torrential rain and marble-sized hail, leaving at least six people crushed to death by falling trees and hundreds of thousands of homes and businesses without power. An 11-year-old New York girl was killed when a large tree toppled onto the car she was in. Police in Newburgh said the girl and her mother had arrived home and were unloading the car when strong winds knocked the tree onto the vehicle. The mother suffered minor injuries. Police were not identifying the mother and daughter as of Wednesday morning, but family friends said the girl was Gina Garzon. An unidentified woman also was crushed to death by a tree that fell on her vehicle as ferocious storms tore through the Orange County city Tuesday. Authorities confirmed her death Wednesday morning but did not have information on her age. Newburgh was among the communities hardest hit by the wild storm, which left nearly a quarter-million customers without power in the tri-state amid flooding downpours, quarter-size hail and gusty winds. In the Rockland County village of Chestnut Ridge, an 80-year-old woman was killed when a tree fell on top of her vehicle as she was driving on Red Schoolhouse Road Tuesday, Ramapo police said. She was pronounced dead at Nyack Hospital. Timelapse video from midtown Manhattan shows the storm rolling into New York City. 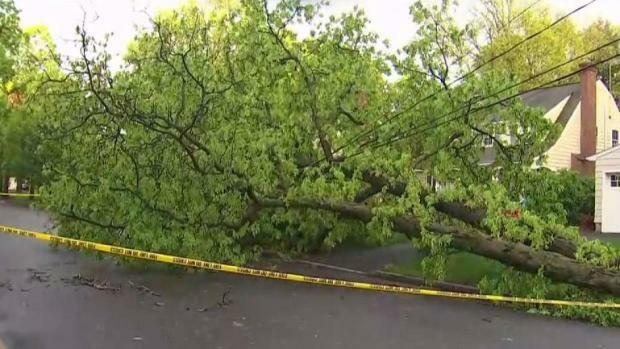 In Connecticut, a man was killed when a tree fell on his truck, according to Danbury Mayor Mark Boughton. A teenager also suffered serious injuries when he was hit by the roof of a dugout on a baseball field, Boughton said. Authorities also said two firefighters suffered storm-related injuries, although it was immediately clear how they were hurt. Officials there said schools are closed Wednesday because of widespread power outages and downed wires through the city. Check school closings here. Meanwhile, in New Fairfield, Connecticut State Police say a tree fell on a car on Brush Hill Road, killing one person inside. That person's identity has not been released. The sixth death was in Pennsylvania's Monroe County; Matthew Ryan was driving when high winds toppled a tree onto his vehicle. The car's roof collapsed completely; Ryan was pronounced dead at the scene. The National Weather Service sent teams of meteorologists to conduct damage surveys in Orange and Putnam counties in New York, with a second team in southern Connecticut, to determine if any tornadoes touched down during the storms, which were so strong they generated a small tsunami in New Jersey. Three tornados were confirmed in New York, according to the National Weather Service: an EF2 in Kent, an EF1 in Patterson -- both of which are in Putnam County -- and an EF0 in Newburgh, Orange County. Two more were confirmed in New Haven, Connecticut. Storms made an abject mess of the commute, as Metro-North suspended all its lines out of Grand Central Terminal. Marc Santia reports. Airlines canceled and delayed flights in and out of the region. 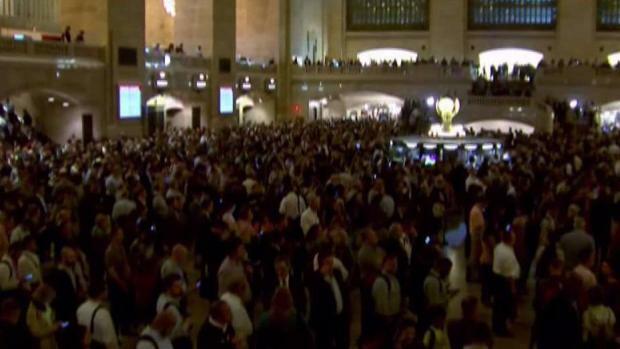 In New York City, thousands of commuters were stranded in Grand Central Terminal after rail lines were temporarily suspended due to downed trees on the tracks. 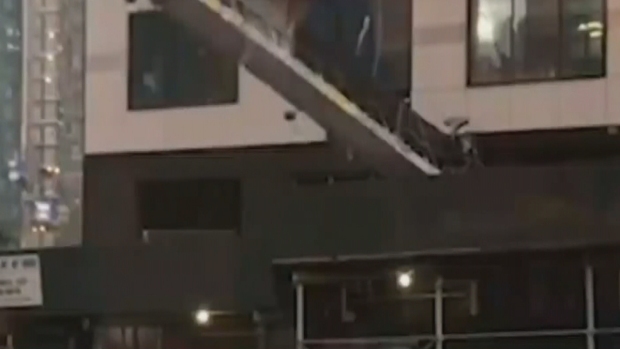 In NYC, giant metal construction pieces and scaffolding were no match for fierce winds -- they were sent whipping and spinning into the air, plunging dangerously onto the street. Checkey Beckford reports. Giant metal construction pieces and scaffolding were no match for the fierce winds -- they were sent whipping and spinning into the air, plunging dangerously onto the street. Toppled trees were a common sight across the city -- in Central Park, in Brooklyn and East Harlem. Uprooted trees were reported across the Garden State, too. In Ho Ho Kus, a tree fell on Bernard Place, hitting a house and car; houses were also seen crushed by trees in Wyckoff and Scotch Plains, along with live downed wires. A lightning strike is believed to have been the culprit for a car fire along Route 46 in Clifton. In Ho Ho Kus, a tree fell on Bernard Place, hitting a house and car; houses were also seen crushed by trees in Wyckoff and Scotch Plains. Ray Villeda reports. More than 250,000 customers were without power across the tri-state during the height of outages Tuesday evening, though power has been restored to tens of thousands since. Damp, cooler weather continues through the day Wednesday and looks to stay unsettled through at least Saturday as temps seesaw back and forth between the 60s and 70s with a chance of thunderstorms or rain on each day.